There is a lot happening behind-the-scenes at Mythic Australia – we’re as busy as a one-armed milker who owns two dairy farms. In house, we are writing, illustrating, model making, creating merchandise, packing and sending, not to mention all the administration. 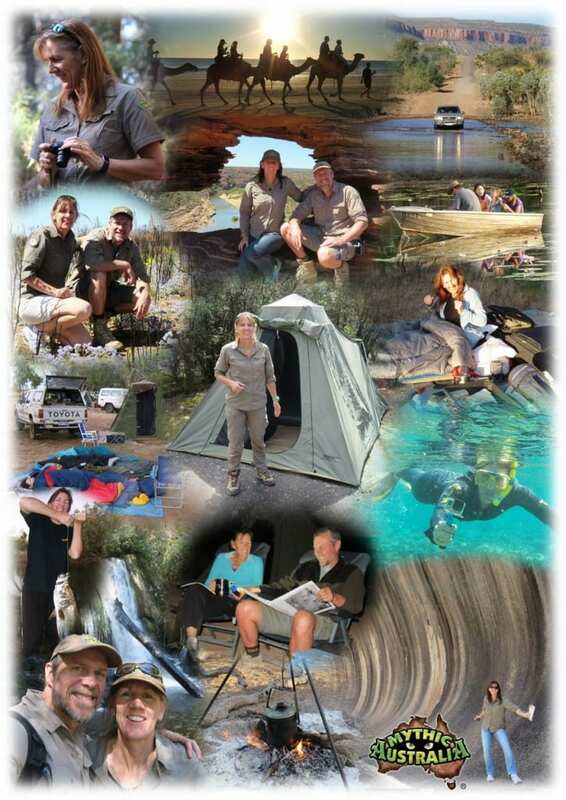 At every opportunity, we go bush taking photos, collecting sounds and inspiration. 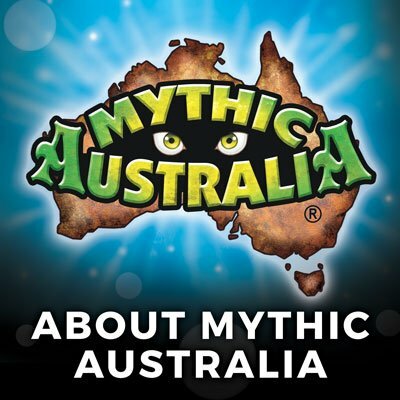 Below is a quick look behind-the-scenes at Mythic Australia. Nothing spoils a fiction than getting the facts wrong. Our enchanted stories are set in real locations so it’s important to get the factual bits right not only in our writing but in our artworks. 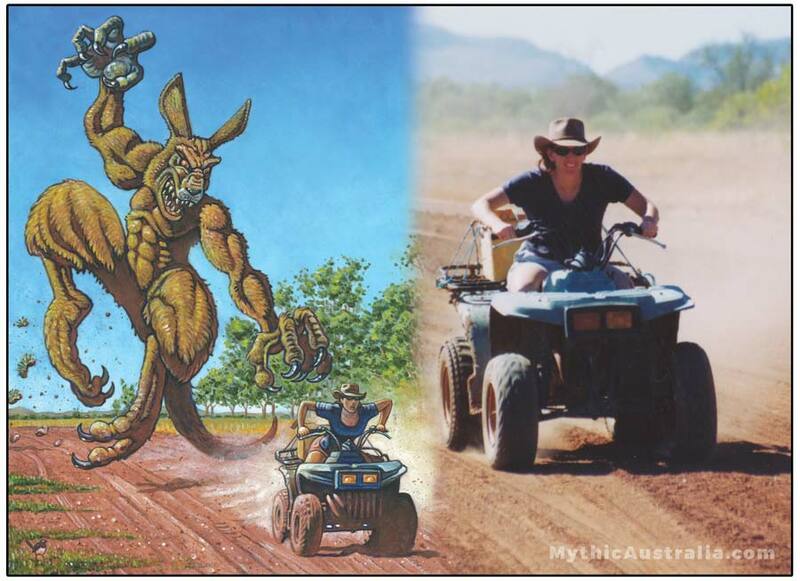 Whenever possible we hit the road travelling Australia to take photos, make sketches and let the country inspire us. 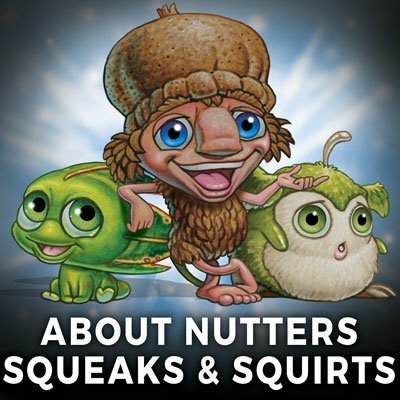 Writing Australian Children’s books about Drop Bears, Nutters and Dragons is a lot of fun but is also a long process of rewrites and editing. 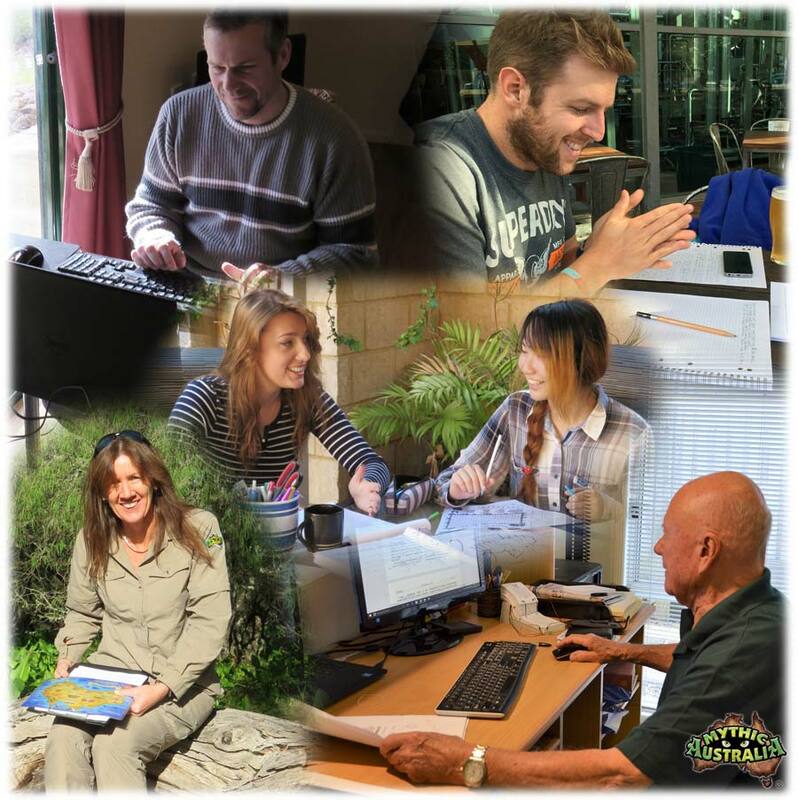 Fortunately, Mythic Australia has a great team of writers and editors. 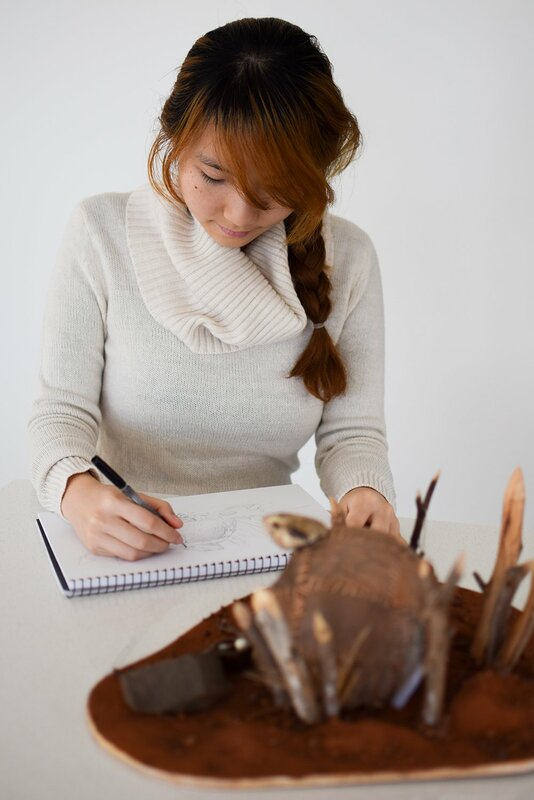 Go for a quick tour with our amazing illustrator, Elin Tan and meet some of the mythic team. 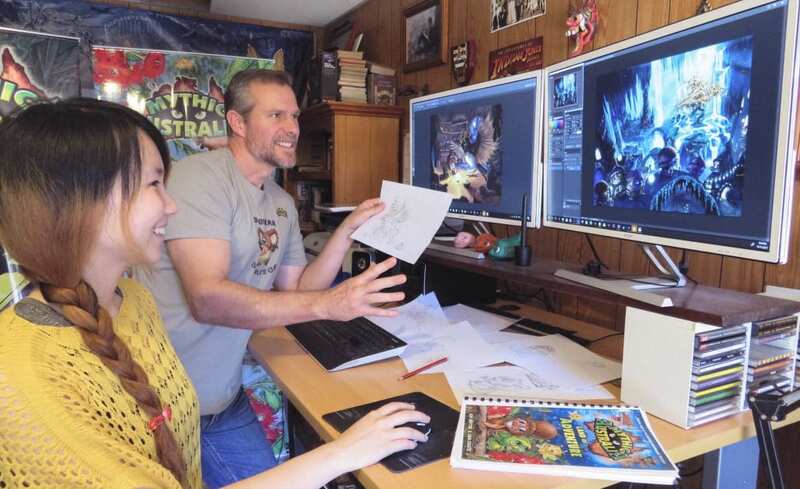 Discover what goes on behind-the-scenes at Mythic Australia and see the process Elin goes through creating her new Picture Book. 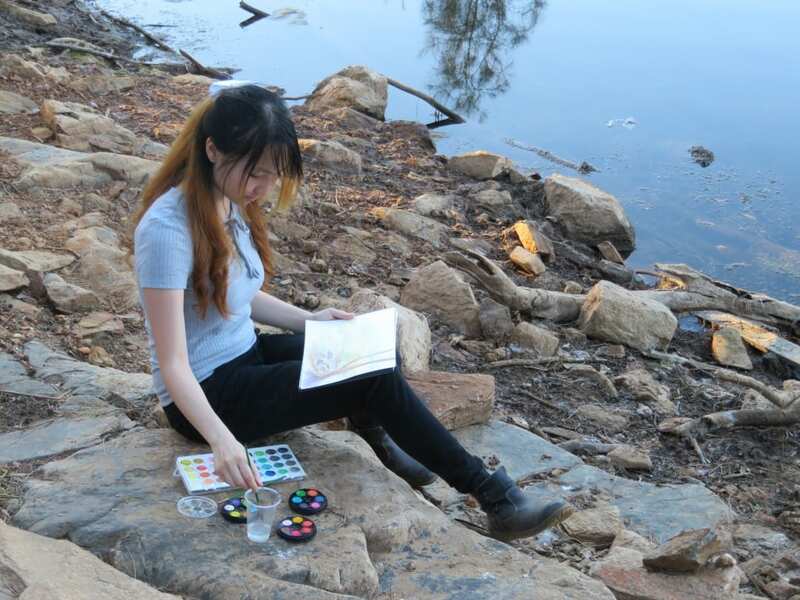 To create engaging artworks for Mythic Australia, our artists: Ian Coate and Elin Tan take their inspiration from the unique shape, patterns and colours found in Australia. They use traditional illustrating techniques as well creating artworks on the computer. Behind every artwork is usually a reluctant model. 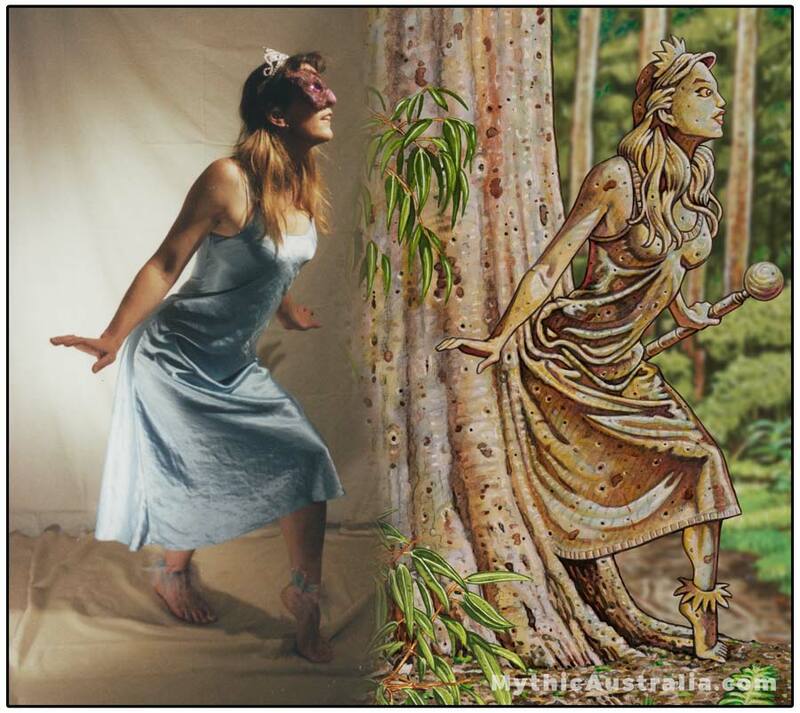 At Mythic Australia we are guilty of grabbing family and friends and dressing them up to model for one of our many artworks. 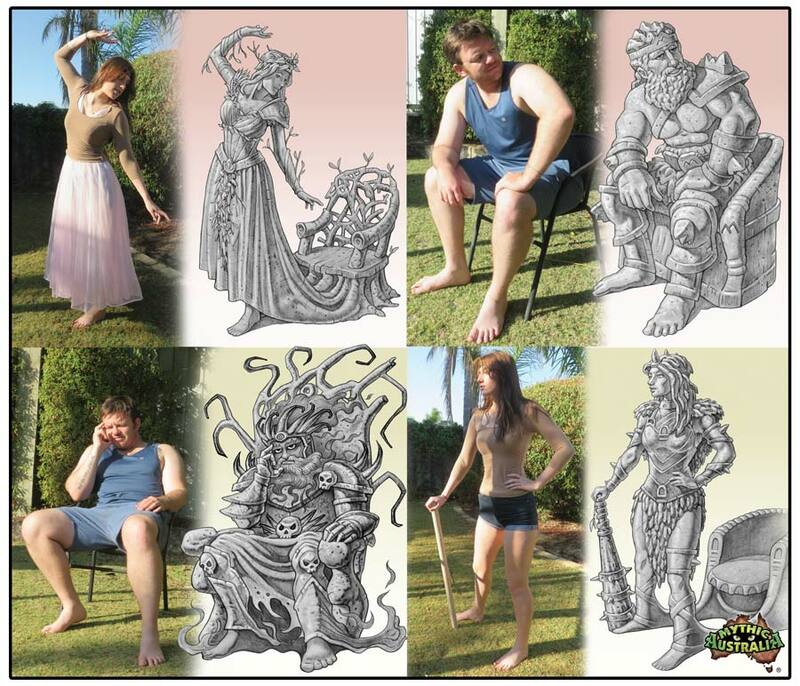 Using models as references give a sense of realism to our fantasy illustrations. 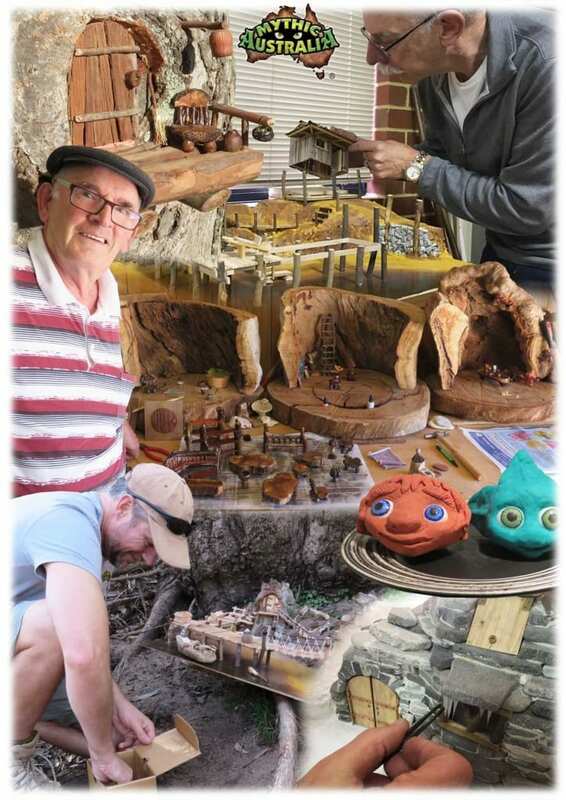 We have a talented crew of modellers who have created imaginative sets and dioramas for Mythic Australia. Dave, John, Howard, Chris and Ian have created unique bush dwellings and Gumtree houses complete with cute furniture from the natural resources such as nuts, sticks and rocks found in the Aussie bush. These sets are so useful to inspire our artists and writers. Due to being so busy creating, we rarely get out to do public appearances. But when we do, we certainly have a lot of fun; and, from the feedback we receive, the people we meet also have a lot of fun. 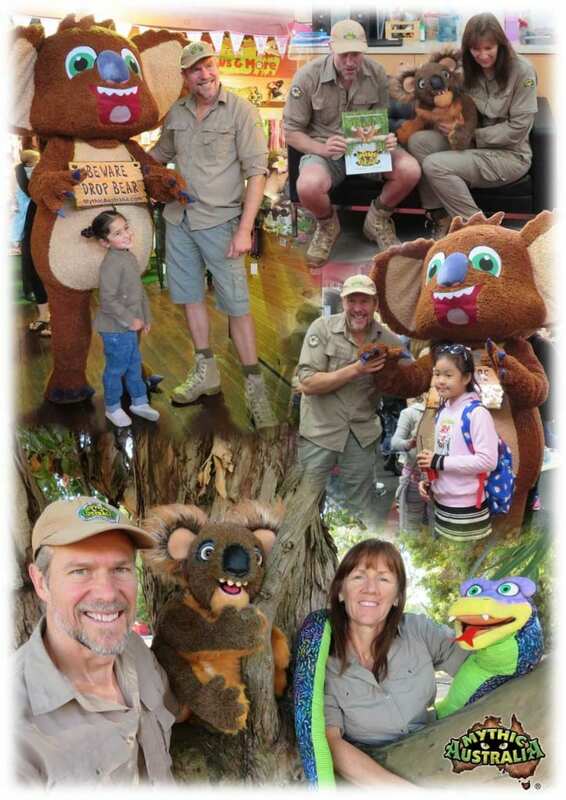 We hope to venture out a lot more in the future so people can meet our Drop Bears and Hoop Snakes. Australia Made is important to us. 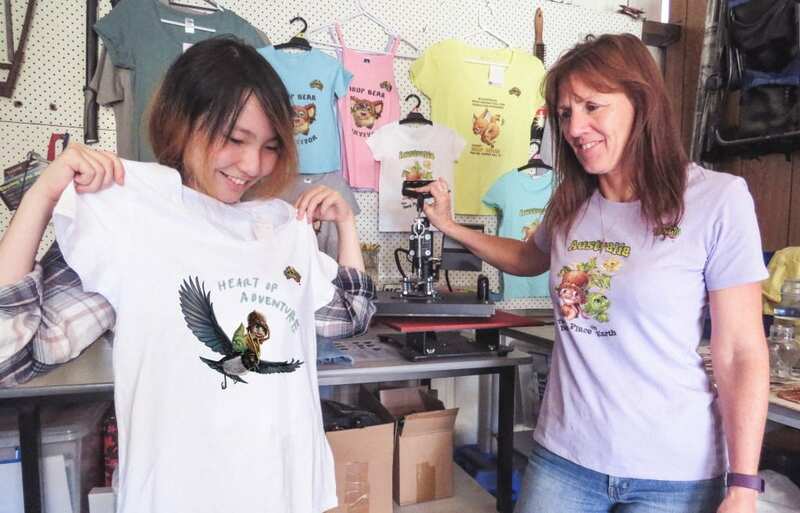 We appreciate when Aussies support our little business so wherever possible we use other Aussie businesses to make our Mythic Australia products. Furthermore, when you order one of our products, it’s also us that packs and sends it out to you, so we always try to enclose something extra to make it more personal. Hi everyone. 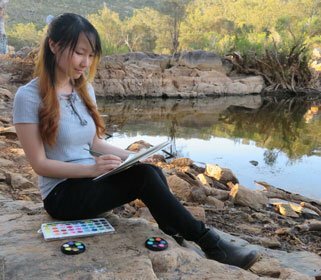 I’m Elin, one of the illustrators working at Mythic Australia. 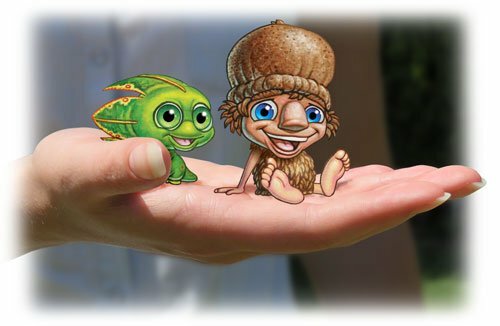 I have been assigned to create the Picture Book for the ‘Land of Adventure’ – the Novel by Kip Nutter and Ian Coate. 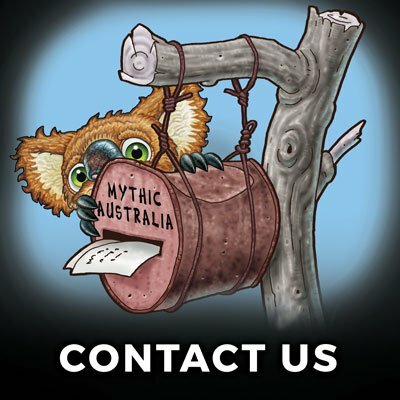 Creating any products for Mythic Australia is a collaborative process. We have such an imaginative team of people all working together, each inspiring the other with their various crafts. 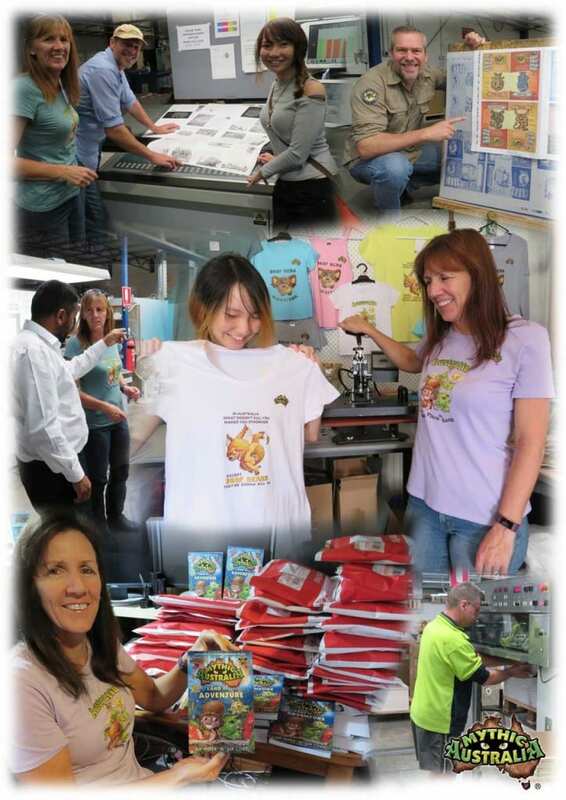 Let me take you behind-the-scenes so you can see the fun process of making a book for Mythic Australia. 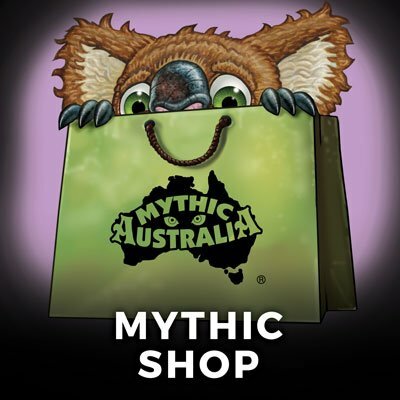 Along the way, we will meet some of the team who make Mythic Australia such a rich and wonderful universe. 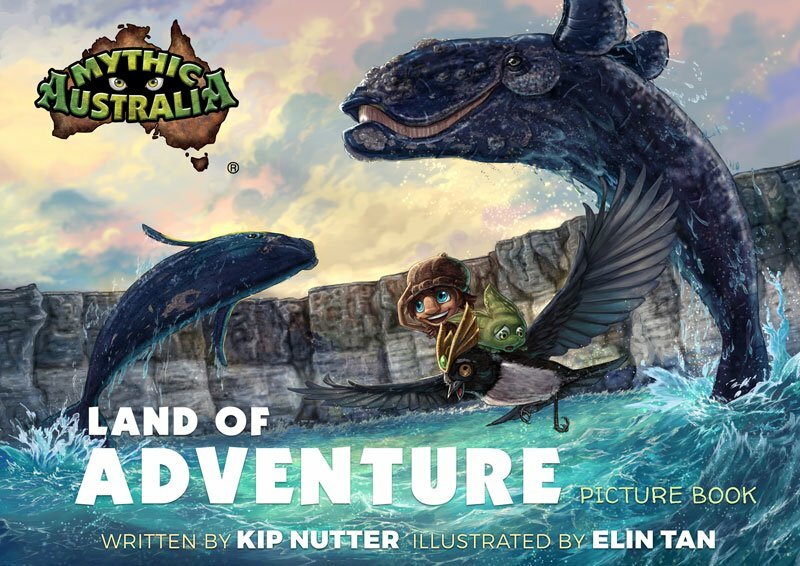 Firstly I was given the ‘Land of Adventure’ Novel (Book 1 in the Mythic Australia series) and asked if I could turn it into a vibrant Picture Book for a younger audience. This would be a challenge; even though the Novel had many illustrations to guide me, they were only black and white. I would need to create new colour compositions from scratch for the Picture Book. To get inspiration, I like to take a trip into the Australian bush. There is no better place to do my initial sketches. Here you can accurately capture the unique colours and shapes of our native flora and landscape. 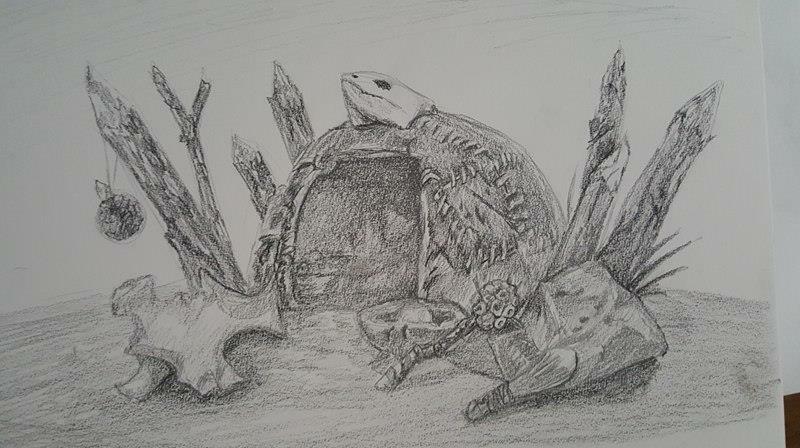 However, it’s nearly impossible to find a mythic magical dwelling to sketch from when you need it. 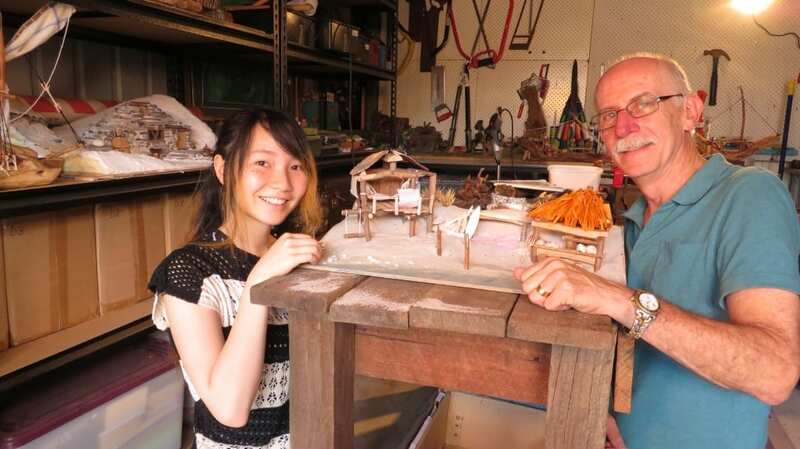 Fortunately, Mythic Australia has a few talented modellers that have made detailed dioramas that were inspired by Ian’s original sketches from the Novel. I went to see Dave Wyatt who was working on a beach scene for Book 2. Dave has created some wonderful landscapes out of materials that he had collected from the bush. These models and dioramas are so helpful for artwork references providing visual information at all angles. The models provide and accurate three dimensional object that makes it easier for us to draw from. It helps create the personality of the environment and its features. 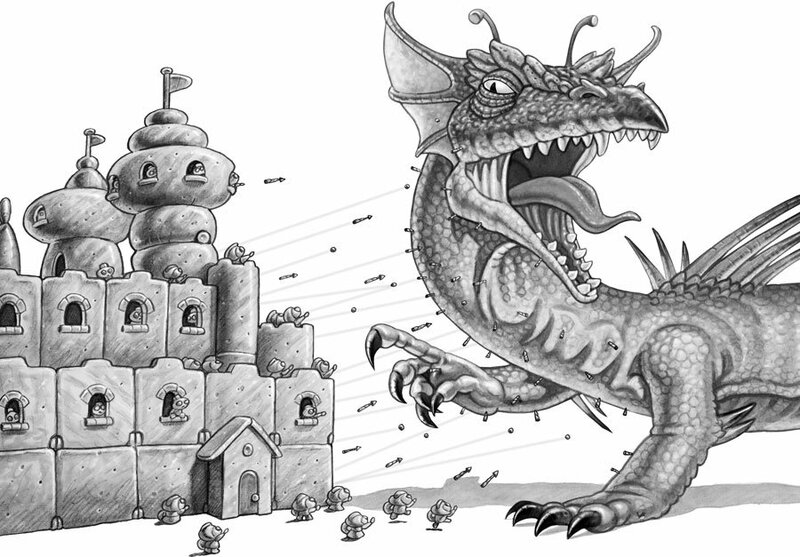 We will then add the mood, atmosphere and story to complement it in our illustrations. I combine my outdoor sketches and model references and start creating an artwork on the computer using Photoshop. 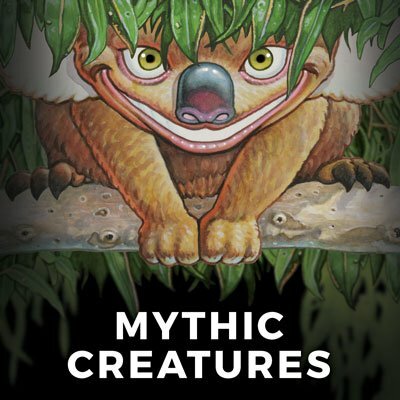 In the office, I work with one of the original creators of Mythic Australia, Ian Coate, on developing the new picture book. It is important to highlight the distinctive features of our landscape and the personality of the artwork. 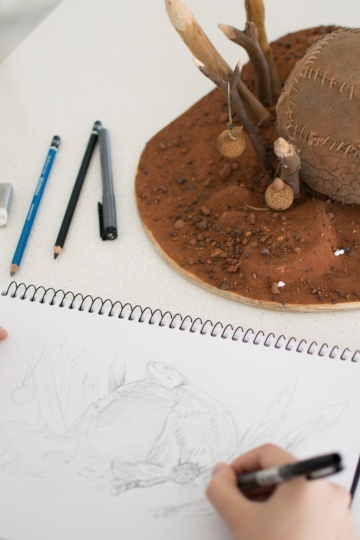 Each illustration tells a different story and we work on making sure they harmonize with each other and reflects the amazing culture and feel of Australia. When I have the thumbs up on the concepts, compositions, colours and characters, the fun begins. 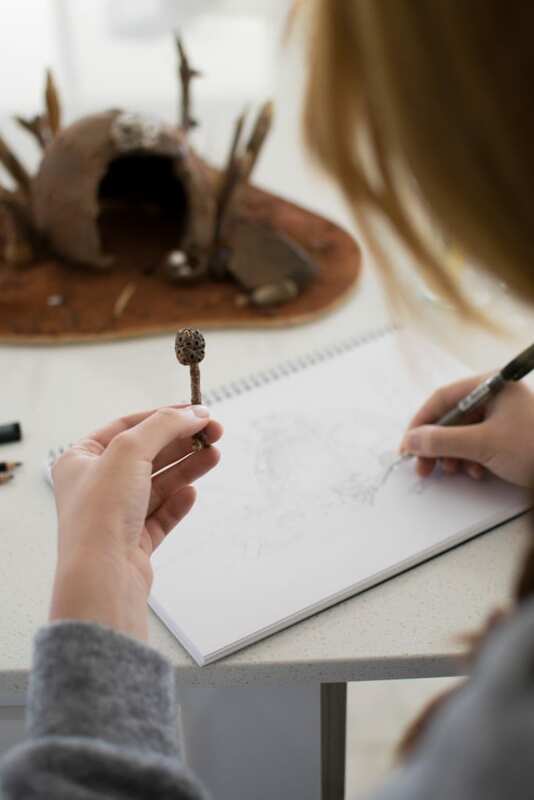 Endless hours are lost in creating these artworks – but time flies when you love what you are doing. Below are some works in progress for the Picture Book. Each illustration goes through detailed research and development to ensure the fantasy landscape reflects the unique feel of the area. Every artwork begins with an idea. 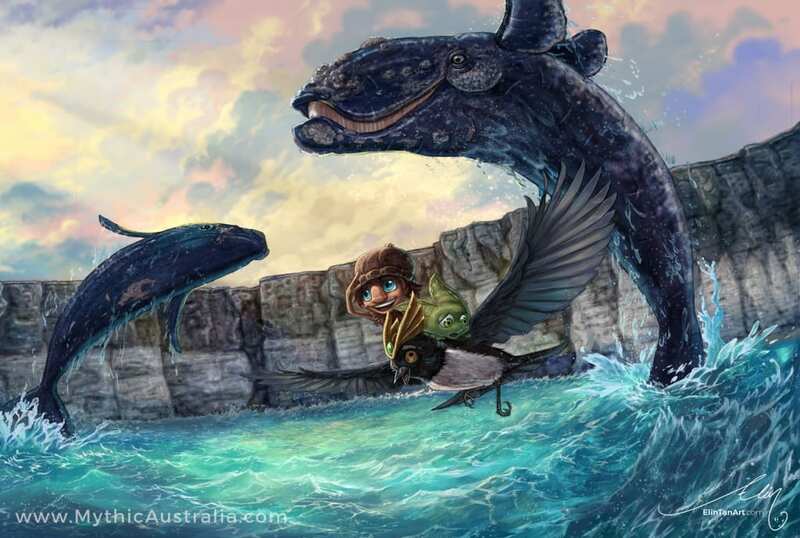 For this artwork featuring the Great Australian Bight, I had a shot in mind that featured the main characters, Kip, Pip and Tattle flying under the brilliant Southern Right whales. For others such as the Cheese & Cake Festival, I like to try out small thumbnail sketches to get an overall mood and composition to the piece. After I have finished my illustrations I send them to Sue, to see if they are suitable to be placed on various products. Not only does Sue handle most of the behind-the-scenes admin but also heads up the design department. She is very keen that Mythic Australia products be produced in-house or made locally by Australian business where possible. 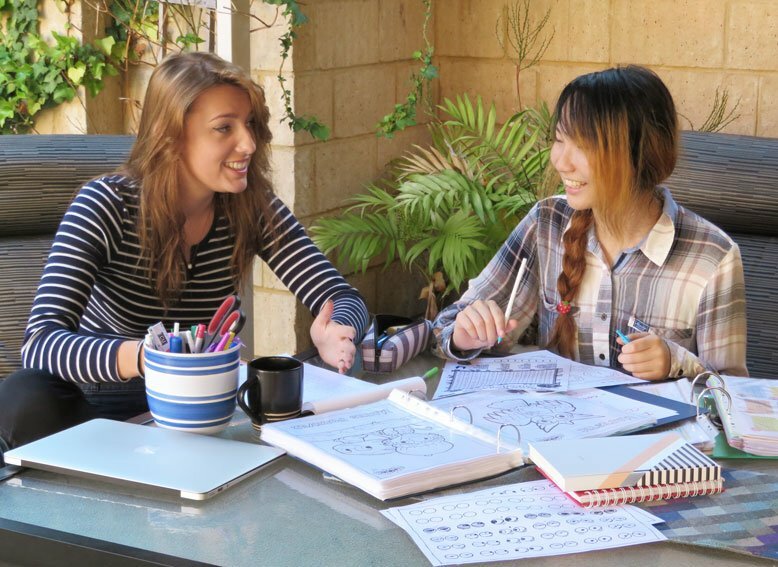 As I am finishing my Picture Book, I visit primary school teacher, Elishah Coate, to work on fun activity sheets that will complement the book. 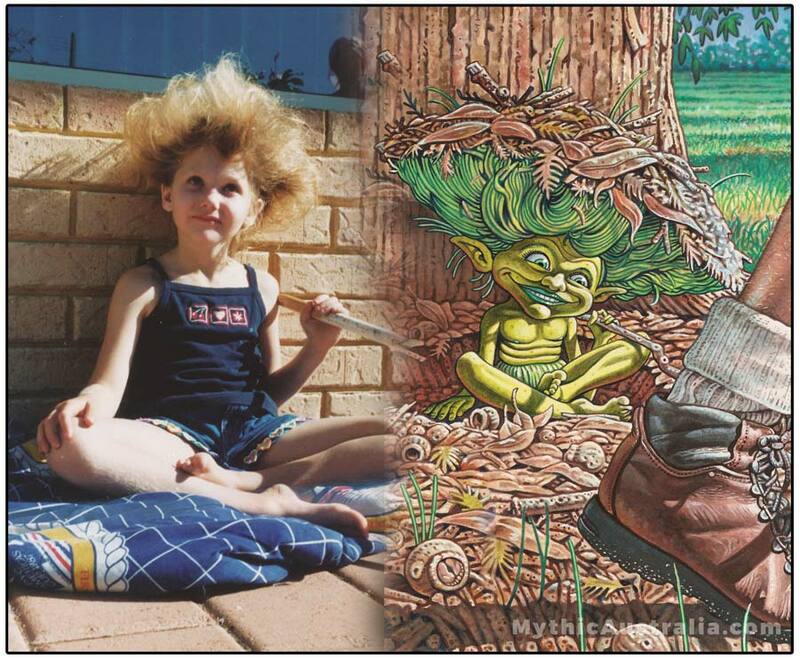 At Mythic Australia, the challenge for us is to engage children in this amazing country. 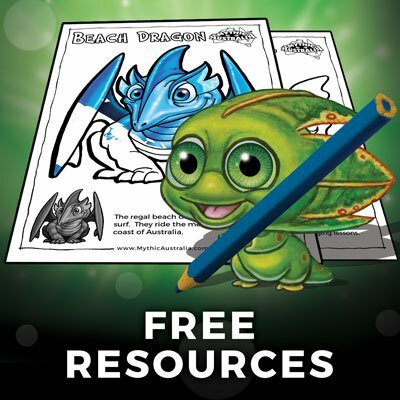 To this end, we have an exciting library of free resources with a true-blue Aussie flavour that parents and teachers can download at no charge. 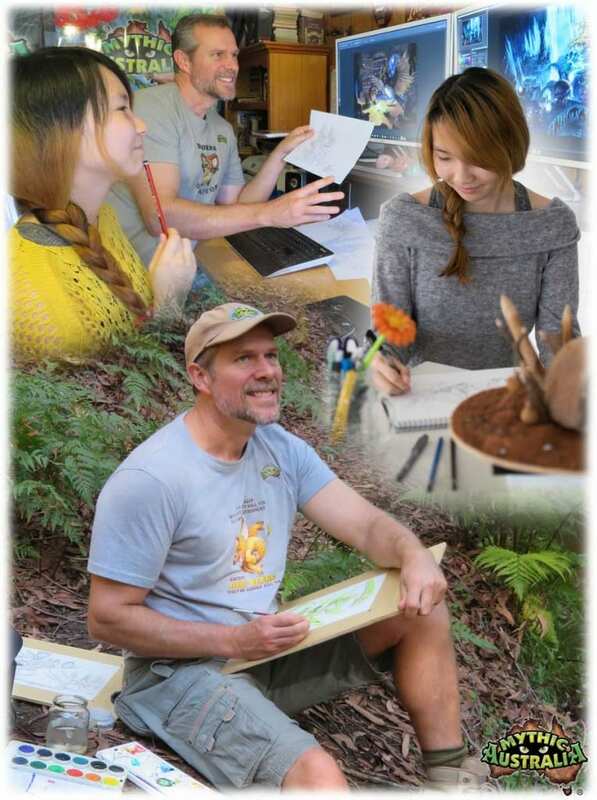 There is colour-ins, educational activities, art lessons and fun student sheets for each Mythic Australia book. 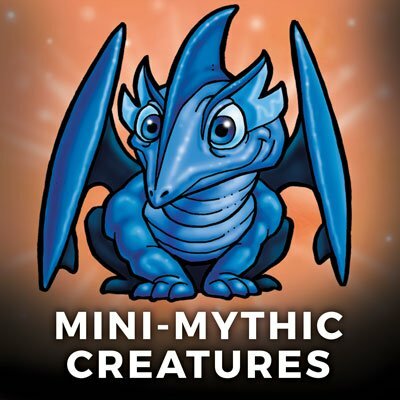 The Mythic team thanks you for joining us! 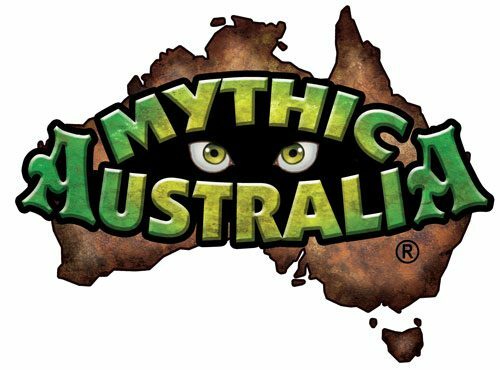 We hope that Mythic Australia can serve to inspire the kids to engage in their love for Australia and the world around them!